Leeds and Rotherham rounded off their Championship campaigns with a goalless draw at Elland Road. In a game of few chances, Leeds midfielder Rodolph Austin had the best effort when his fierce 35-yard strike was deflected wide. 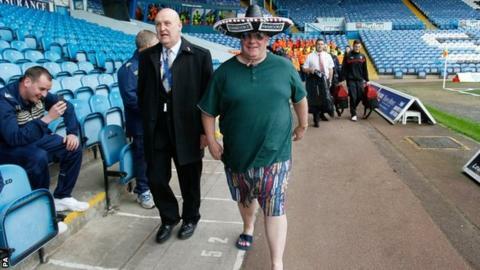 Millers manager Steve Evans arrived wearing a sombrero, shorts and flip-flops, keeping a promise he had made to fans if his side stayed up. Rotherham had already guaranteed their survival by beating Reading on Tuesday. A campaign was launched to get Evans to go through with his pledge and more than 10,000 tweets were posted with the hashtag #sombreroforSteve. He stepped off the team coach wearing a hat and sunglasses, and in beach attire. Whilst Evans looked flamboyant off the field his side were far from it on it as they only mustered one shot on target in the entire match. Danny Lafferty nearly put the Millers ahead but his diving header narrowly went over the bar. The home side had a couple of decent chances to take the lead but Liam Cooper's header was excellently saved by Emi Martinez before Kari Arnison's superb tackle denied Charlie Taylor a certain goal. Rotherham's Danny Ward thought he had put his side ahead only to see team-mate Matt Derbyshire inadvertently get in the way of his goal-bound strike. Leeds pushed for a winner late-on and Austin's driven effort looked to have provided it only for Martinez to make another solid save. The draw meant both Leeds sides ended the season safely in 15th and 21st place respectively. Leeds head coach Neil Redfearn on his future: "We're free now obviously to discuss things and talk about stuff, so I would expect next week we'll sit down and chat. "The important part now becomes the recruitment part and if I'm going to be here I'd like to be part of that. "It's important because if you recruit well and get the right players, you can supplement what we've done and this close season we need to recruit better." Rotherham manager Steve Evans: "We played particularly well here and we go away hung up not to win, we passed and moved it around. "You can't ask any more of them when they know they're safe just to have the same application they have had all season. "I have often said I am immensely proud of them and I am now." Match ends, Leeds United 0, Rotherham United 0. Second Half ends, Leeds United 0, Rotherham United 0. Attempt missed. Jonson Clarke-Harris (Rotherham United) left footed shot from outside the box is close, but misses to the right from a direct free kick. Attempt saved. Sol Bamba (Leeds United) header from the centre of the box is saved in the bottom left corner. Assisted by Luke Murphy with a cross. Corner, Leeds United. Conceded by Lawrie Wilson. Corner, Leeds United. Conceded by Emiliano Martinez. Attempt saved. Rodolph Austin (Leeds United) right footed shot from outside the box is saved in the bottom right corner. Assisted by Brian Montenegro. Substitution, Leeds United. Brian Montenegro replaces Steve Morison. Corner, Leeds United. Conceded by Daniel Lafferty. Foul by Lawrie Wilson (Rotherham United). Aidan White (Leeds United) wins a free kick on the left wing. Attempt missed. Kári Arnason (Rotherham United) right footed shot from outside the box is high and wide to the right. Assisted by Daniel Lafferty. Substitution, Rotherham United. Paul Green replaces Lee Frecklington. Substitution, Leeds United. Aidan White replaces Alex Mowatt. Attempt missed. Billy Sharp (Leeds United) right footed shot from outside the box is high and wide to the right. Assisted by Rodolph Austin. Attempt missed. Alex Mowatt (Leeds United) left footed shot from outside the box is too high from a direct free kick. Luke Murphy (Leeds United) wins a free kick in the attacking half. Attempt blocked. Billy Sharp (Leeds United) right footed shot from the centre of the box is blocked. Assisted by Sam Byram. Substitution, Leeds United. Billy Sharp replaces Gaetano Berardi. Charlie Taylor (Leeds United) wins a free kick in the defensive half. Offside, Rotherham United. Danny Ward tries a through ball, but Lawrie Wilson is caught offside. Attempt missed. Danny Ward (Rotherham United) header from the centre of the box misses to the right. Assisted by Lawrie Wilson with a cross. Attempt saved. Liam Cooper (Leeds United) header from the centre of the box is saved in the top centre of the goal. Assisted by Luke Murphy with a cross. Attempt blocked. Alex Mowatt (Leeds United) left footed shot from the left side of the box is blocked. Assisted by Steve Morison.